The ProGrade triple deck washing screen ... patented design. 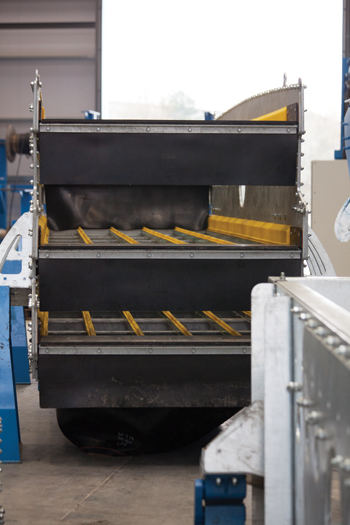 Materials washing specialist CDE Global has introduced a number of new screens in the ProGrade range which include a new patented screen design system. CDE says the new screen design system results in a stronger but lighter screen which requires less power. This is possible as a result of the design of the side walls on the screens. The new bolted screens also include zero welds and are galvanised as standard, all of which serves to maximise plant life, maximise plant availability and minimise the time required for maintenance, according to the UK-based firm. An additional feature of the new ProGrade screens is the patent-pending CDE U-Span cross members. The new cross member design is modular across the ProGrade range and also includes zero welds. As well as offering enhanced geometric consistency, the new design facilitates increased space between screen decks, allowing for quick and easy access to replace screen media, says Kevin Vallelly, CDE’s product development manager. The new screen design system is now available on the ProGrade P2-75 (two-deck 5 m by 1.5 m screen), P3-75 (three-deck 5 m by 1.5 m screen) and P2-108 (two-deck 6 m by 1.8 m screen). Over the course of the next few months, the new design will also be offered on the ProGrade P3-108 (three-deck 6 m by 1.8 m screen). CDE Global is a leading provider of washing equipment for quarries, mines and recycling operations on the global market. Its equipment range has applications across a wide range of materials and is delivering significant efficiencies in the construction and recycling, mining, specialist industrial sands and environmental sectors. Working across four sectors and seven regions, CDE has been co-creating with customers for more than 20 years to deliver collaborative, imaginative and unique processing systems.